You’re going to explore some of Boston’s most popular historic attractions and points of interest on this three day Pilgrim and Patriots extravaganza! You’ll hit the Freedom Trail, enjoy a Sunset Harbor Cruise, pitch some tea into the drink like the Sons of Liberty before you, trip the lantern light fantastic with the restless spirits of Plymouth’s Burial Hill, step aboard “Mayflower II”, “touch” legendary Plymouth Rock and experience the American Revolution firsthand at Minuteman National Park. 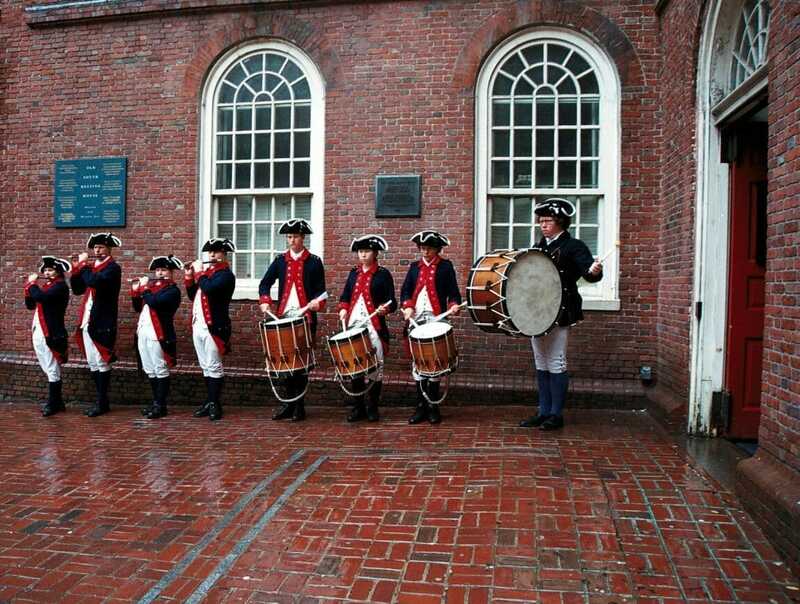 Your young patriots will enjoy Faneuil Hall and Marketplace as their introduction to “Beantown” - this treasured meeting hall and historic landmark was established way back in 1742. A hoppin’ gathering spot for tourists and local, alike, it features oodles of eclectic, live entertainment, fantastic shopping at more than 70 retailers and an array of excellent dining options; it’s also the home of the world-famous Quincy Market Colonnade and the Finch and Bull – the watering hole made famous in the long-running mega-hit sitcom, “Cheers." A well-known stop on the Freedom Trail, Faneuil Hall is sometimes referred to as "the Cradle of Liberty"; its proximity to favorite local attractions makes it the perfect place to while away a few hours before heading off to explore them! Be it a carefree gambol, or deliberate march – a trip down this oft-travelled 2.5-mile brick-lined path will bring your student group around to 16 historically significant landmarks - the Bunker Hill Monument, Old North Church, the Boston Massacre Site and the Paul Revere House among them - and all along the way, you’ll hear the fascinating true tales of the courageous Bostonians and colonialists who dared challenge Britain and went on to establish the greatest republic in the world! In front of the old State House - also known as Boston's "Towne House"- your student group will find a swirl of cobblestones marking the site of the Boston Massacre. Tensions between the colonialists and occupying Redcoats ran high that March in 1770, and a minor squabble between a wigmaker's young apprentice and a hot headed British sentry quickly escalated into a deadly riot. Soldiers coming to the aid of the guard were met with an onslaught of sticks, stones, snowballs and other such crude weapons of the moment, and fired directly into the angry crowd, killing five colonialists. Samuel Adams and other patriots dubbed the unfortunate event a "bloody massacre". “One, if by land, and two, if by sea;” it’s a given - every young scholar is familiar with Longfellow’s “Paul Revere’s Ride.” On the evening of April 18, 1775, Robert Newman, and Vestryman Capt. John Pulling, Jr. climbed the Old North Church steeple – at the time, the tallest building in Boston - and held high two lanterns as a signal from Paul Revere that the British were, indeed, marching to Lexington and Concord by sea across the Charles River - the most expeditious approach possible - and not by land. (This was actually a back-up plan; Revere was able to complete his daring ride and warn his fellow countrymen.) Founded in 1722 as Christ Church, it’s Boston’s oldest surviving church building and most visited historical site; popular 30-minute guided tours tender guests an engaging, in-depth look at the Old North and its critical role in history. The Battle of Bunker Hill pitted a newly-formed and quite inexperienced colonial army against the highly trained British. Despite considerable shortcomings, the colonialists marched under the skillful command of such men as Colonel William Prescott, Colonel John Stark and General Israel Putnam - men who’d amassed plenty of experience fighting alongside the British in the French and Indian War. Although the British Army ultimately prevailed in the battle, the colonialists greatly surprised the British by repelling two major assaults and inflicting great casualties on the Redcoats. The original monument to the Battle of Bunker Hill was an 18-foot wooden pillar with a gilt urn erected in 1794 by King Solomon's Lodge of Masons in honor of fallen patriot and fellow mason, Dr. Joseph Warren. In 1823, a group of prominent citizens formed the Bunker Hill Monument Association to construct a more permanent, significant monument commemorating the famous battle; the existing 221 foot granite obelisk was completed in 1842 and dedicated on June 17, 1843, in a major national ceremony. Ahoy! You and your crew will head out on an entertaining and educational sunset cruise of historic natural estuary Boston Harbor for a perfect finish to Day One of your Pilgrims and Patriots adventure! This exhilarating 90-minute excursion gets you out onto the water where you’ll enjoy plenty of popular legend and lore, breathtaking views of the nation’s oldest continuously-manned lighthouse, the Harbor Islands National Park Area and Boston’s working port, a sneak peek at the “lush life” on the waterfront, and the best seat in the house to catch the U.S.S. Constitution’s evening ritual as she fires her cannon and lowers her flag, ceremoniously signaling the day’s end. Rise and shine! You and your young patriots are heading to the floating Boston Tea Party Ships and Museum for a “revolutionary” interactive experience not to be missed! These one-of-a-kind, one-hour Tea Party tours let you meet and mingle with the “colonialists,” explore authentically restored tea ships, enjoy a rousing multi-sensory presentation and dump tea overboard just as the Sons of Liberty did that fateful night of December 16, 1773. Drop in at Abigail’s Tea Room for teatime, then pop by the Gift Shop for your Tea Party souvenirs! You’re going to see notorious Plymouth Rock as it quietly rests away from the relentlessly battering sea in a sheltering Portico in Pilgrim Memorial State Park, today just a portion of the original 15 foot long, 20,000 pound boulder discovered long after the landing of the 102 intrepid Pilgrims at Cape Cod, yet, somehow determined to have been the place they first stepped off the Mayflower. Do you believe the stories? While the original Mayflower no longer exists, you’ll get an authentic feel for the Pilgrim’s arduous 17th century voyage across the Atlantic as you step aboard the full-scale reproduction, Mayflower II. Inhale the bracing sea air and look around: you’ll at once marvel and wonder how in Heaven’s name 102 people could cram themselves and their belongings onto such a small vessel – for 10 weeks at sea! At Plimoth Plantation, you’re whisked back to the 1600s, to visit an authentic Wampanoag Homesite, explore a recreated English village and experience the bustling Craft Center – where everything on the Plantation - from Native implements and regalia to traditional cabinetry, pottery and clothing - is painstakingly crafted, the old-world way by skilled artisans. You’ll even meet the hardy – if unusual - Heritage Livestock of Nye Barn and tour a working gristmill! After an excellent day and fine evening repast, you and your young charges will meet up with your friendly area paranormal investigator who’ll usher you along the paths of Burial Hill, Plymouth’s oldest cemetery, on a truly “spirited” 90-minute ghost hunting excursion. Be ready; your tender ears will be filled with spooky stories - local legend and lore just oozing mystery and macabre. See the original burial site of the Pilgrims and wend your way down one of the oldest streets in America toward Town Square, said to be forever cursed by King Philip. You’ll encounter tombstones dating back to the 1600s, pick up a few tips on deciphering their intentionally “cryptic” effigies and epitaphs, and discover why restless spirits continue to roam these wicked, winding paths; you’ll even learn how to capture these freaky phantoms on film . Can you “conjure up” a better way to wrap up Day 2 of your Pilgrims and Patriots Tour? First stop on Day Three of your excursion will be The National Heritage Museum in Lexington, Massachusetts - a venerable little institution and beautiful, hidden gem on the Battle Trail of Lexington with an emphasis on American history and Freemasonry; the Museum also houses the Van Gorden-Williams Library & Archives. It was founded and is funded by the Northern Masonic Jurisdiction of the Scottish Rite, an appendant body of Freemasonry; because of this association, the museum's legal name is Scottish Rite Masonic Museum & Library, Inc.
Concord, Massachusetts boasts a long, rich American history. It was the site of the first battle in the American Revolution and the home of celebrated wordsmiths Henry Thoreau, Ralph Waldo Emerson, and Louisa May Alcott. At Concord Museum, which houses one of the oldest and most cherished collections of Americana in the country, the city’s role as a cultural center is celebrated throughout, in its ever-changing exhibits, in its galleries housing relevant displays of intriguing artifacts and in its perfectly furnished period rooms. Here, amongst myriad Colonial memorabilia, you will find one of the lanterns hung from the North Church tower on the eve of Paul Revere’s Ride, authentic weapons from the American Revolution, the contents of Thoreau’s Walden Pond house, and Emerson’s study. Here, the Revolution comes roaring to life in all its fury as your and your students explore the battlefields and structures associated with April 19, 1775, and witness the American revolutionary spirit through the writings of the Concord authors. At the Minute Man Center, you’ll enjoy an informative multimedia theater presentation outlining the events of that history-making, world-changing day, and an exciting array of ranger-led programs and demonstrations get you right into the thick of things- you are there! Experience the “combat area”, learn what battle training was like in 1775, enjoy a musket firing demonstration, view the Revolution from a Redcoat’s side of the fence, walk the historic Battle Road Trail…and more!